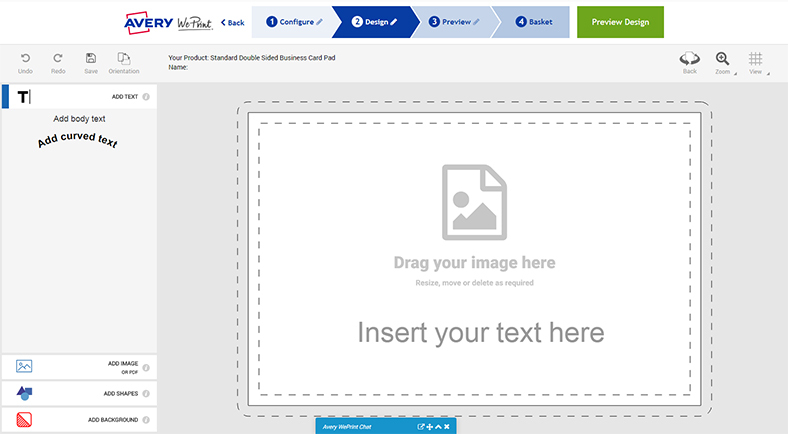 We recently made some changes to the Online Design Tool to make it even simpler to use. So if you like to design your products yourself – or if you’d like to have a go – it’s now easier than ever to create designs with our online tool. 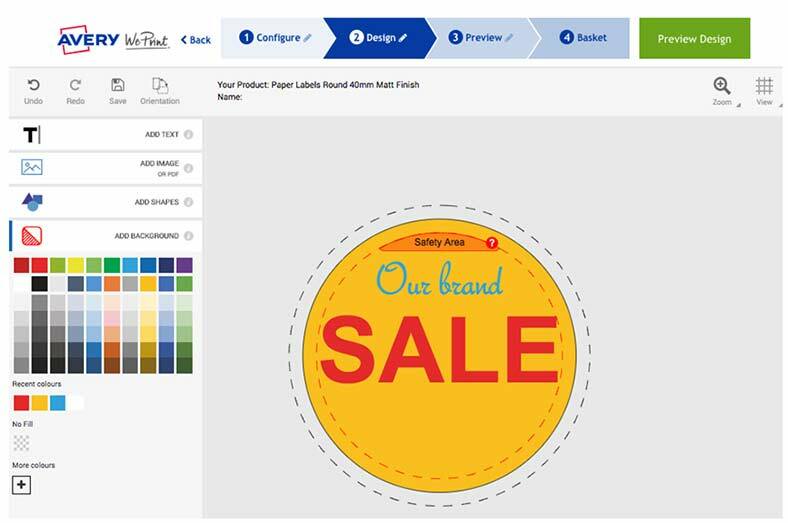 To get started, you just need to decide which Avery WePrint product you want to customise. The Design Tool lets you work on our full range of labels and stickers, business cards , cards, ring binders and laptop skins , or labels for CDs and DVDs . The Design Tool makes it possible to achieve a really professional look without adding designers’ fees to your costs! This screen also gives you the opportunity to change your product selection. Basket – Confirm that you’ve reviewed your design and your basket will show the quantity, which you can amend, the cost, and a button to the secure Checkout. We’ve simplified the options and the workspace in the Design Tool. But we’ve kept all the great things you can do with it to customise your Avery WePrint products. Outside – to make sure your design goes right to the edge with no white showing, if you want to print to the edge. Whether you’re using one of our templates or designing from scratch, the design tool gives you complete freedom to adjust your design exactly how your want it. Type straight or in a curve with a fully adjustable arc. Straight and curved text can go in any angle if you click on the small circle below the text box. There are over 40 fonts to choose from. Make your text larger or smaller. You can leave a blank background or add a colour. Click on the shapes option, and you can add a straight line, arrow, rectangle, square, circle, oval, cloud bubble, speech bubble, hexagon, pentagon, triangle or star. You can make lines and shapes exactly the size you want by pulling the corners, and you can choose to have just the outline or the filled shape. You can add an image or PDF from your computer. Text and shapes can go over images. Your text, background, shapes and lines can be any colour you want. The full spectrum is available . To help you get the layout exactly right, click on ‘View’ to see your design in an adjustable grid. Another new Design Tool feature is the helpful information boxes that pop up by the text, image, shapes and background options. You can also use the undo and redo buttons to go back or forward through your actions. And there’s live chat between 9am and 5pm Monday to Friday (except bank holidays) if you get stuck. To begin, choose the Avery WePrint product you want to customise. If you need any inspiration, see our Blog, or check out our piece on How to be your own graphic designer.